The Dutch Caribbean Nature Alliance (DCNA) has made available a GIS User Manual that guides nature managers step by step through relevant GIS skills whilst using their own data in ArcGIS and Google Earth Pro. 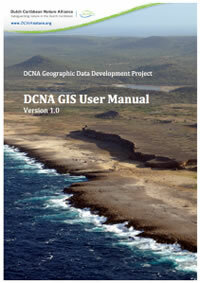 The DCNA has now trained 16 persons in GIS from Aruba, Bonaire, Curaçao, Saba, St. Eustatius and St. Maarten. It found that one of the biggest concerns in terms of GIS use is the lack of access to reliable and usable data - which sounds rather familiar. However, they've had their own GIS expert and many other persons have a go at this problem and so now the DCNA also offers a set of GIS data for the six islands. If interested you'd have to contact the DCNA but one can already find their training materials online (in English). I haven't seen either the Manual or data myself, but I like the sound of this initiative. Lekker. Thanks Kate.